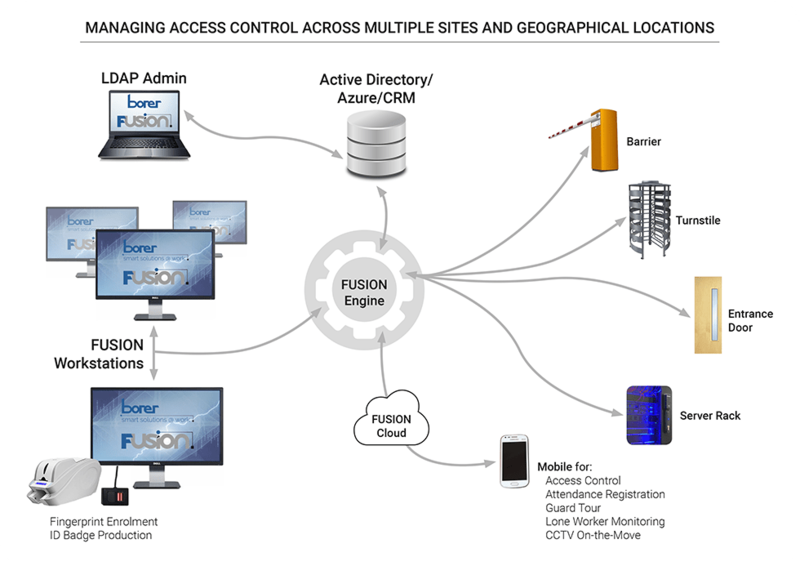 FUSION is a network-based multi-location security management system that can work from a central database that holds personnel credentials and records, enabling access across multiple sites to be centrally authorised. The system integrates access control and building alarm monitoring and management with IP based CCTV so that several sites can be overseen and managed from any workstation on the network. 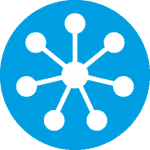 FUSION uses existing LAN/WAN and Active Directory to manage user permissions for physical access control. Any door, turnstile or barrier, no matter where it is located, can be managed over the IP network. FUSION uses Active Directory's replication and data back-up and security provisions which are already in-place to support the physical access control database. Organisations that provide services locally or across a number of regional, national or global sites can have all their access-controlled doors, alarm points and security cameras connected to their WAN. The local IP-based door controllers receive a user’s card credentials from the card reader at the door over the WAN. The FUSION service validates the access request and responds with access granted or denied. Irregularities, anomalies and alarms are captured by cameras and streamed to Network Video Recorders (NVR) for real-time or on-request viewing. FUSION can sit alongside in-house or cloud hosted databases such as LDAP, Azure or a cloud hosted CRM. Access control requests from door controllers on the network are referred to a central or a site-networked controller. If the user has access permissions, the TCP/IP enabled door controllers will be instructed to release the portal to give access. This solution model provides access to thousands of users across regional, national and international boundaries. FUSION delivers an inherently scalable physical access control solution that works with existing IT infrastructure and access management solutions. An open standards-based approach together with the ability to handle multiple RFID card technologies means it is possible to re-use existing ID card credential and card reader hardware. FUSION software takes the hard work out of managing site security across multiple locations by providing an integrated approach to controlling, monitoring and managing security. Supports secure up-to-date contactless smart cards including MIFARE®, DESFire® and RFID technologies as well as legacy products such as Wiegand readers. User data acquired from existing LDAP, CRM or HR systems together with the administration of access permissions to secure facilities and selectively grant personnel access. Control physical access across any number of locations, without fuss, using existing network infrastructure. Staff and visitor tracking in real-time with new user access credential and updates distributed automatically to all doors. Eliminate duplication of personal data entry and data inconsistencies between physical access control system and principle source of data (LDAP/HR/CRM systems). Include location-based restrictions limiting and enabling personnel access to other sites according to access permissions. Security access permissions can be grouped according a person’s role or training (e.g. only qualified electricians can have access to switch rooms). Lists of all alarms and associated response taken.